When it comes to low-slope roof membranes there are differences you should be aware of. As a building owner, it can be helpful for you to understand the characteristics of the roof membranes on your building. EPDM is the most common membrane and is a black synthetic rubber roof membrane. EPDM roof membrane can be secured in a number of ways. You can use large stones or concrete pavers, known as ballast, to cover the EPDM membrane. The weight of the ballast secures the above-deck roof insulation and roof membrane. If there is no ballast, the system mechanically adheres. A mechanically adhered system has round plates that are aligned a few inches inside the laps in the membrane. You can easily identify a mechanically adhered roof by dragging your foot across the membrane and if it wrinkles in front of the foot, it is likely mechanically attached. These systems more readily show the joints in the cover boards and will likely have plates visible beneath the membrane. EPDM membranes are also typically are joined at the seams with two-sided adhesive tapes. TPO roof membranes are usually white and can be ballasted, fully adhered, or mechanically attached. The vast majority are mechanically attached. TPO membranes have become more common over the past several years and much of this popularity has to do with being thermoplastic. This means the seams are welded together to provide a mostly homogeneous membrane. PVC membranes are similar in appearance to TPO membranes in that they are typically white. They also are thermoplastic but happen to be more pliant than TPO membranes and will conform with substrate changes more readily. If a roof system is not a single-ply roof membrane, then you likely have bituminous membrane, which is asphalt- or coal tar pitch-based. Bituminous membranes typically present as built-up roof (BUR) membranes or polymer-modified bitumen membranes. BUR membranes can be hot tar pitch membranes or constructed using “cold process” adhesives. BUR roof systems are multi-ply roof systems that are constructed by a roofing crew. BUR membranes usually have one of three surfacings. They are either bitumen and gravel, mineral-surfaced cap sheets or a liquid-applied roof coating. The benefit of a roof coating is to provide reflectivity, ultraviolet protection, and to withstand tough weather conditions. Polymer-modified bitumen membranes usually consist of an unsurfaced base layer of polymer-modified bitumen membrane which is adhered to a substrate and a cap sheet. The most common methods for installation of polymer-modified bitumen membrane application are hot-applied, which is using hot asphalt, cold-applied which involves using cold adhesives, or torch-applied. Cap sheets can be surfaced with minerals, granules or foil facer, or a protective coating, such as an aluminum coating, over the cap sheet can be applied. 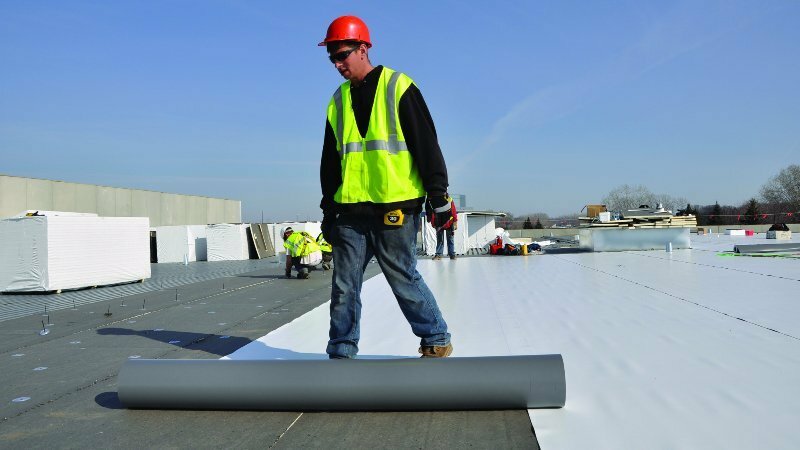 Understanding the differences between low-slope roof membranes will help you to make an informed decision when it comes to having roofing discussions with your hired contractor.